This is the alternative version of the 1969 Shell collector set from Germany. One board had holes in a 2-3-5 formation and the other in 4-2-4. The coins were identical. Please help me with the players in this set. I have 18 different player coins but there are only 17 spaces and players listed. The additional player is REINHARD LIBUDA, was he a late addition and were there any more? 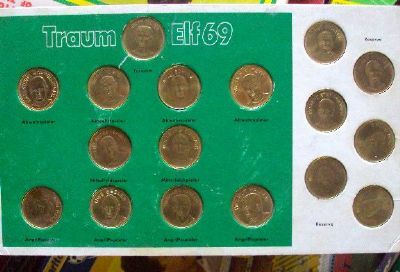 The 18 coins are Franz Beckenbauer, Bernd Dorfel, Klaus Fichtel, Helmut Haller, Sigi Held, Horst-Dieter Hottges, Sepp Maier, Gerhard Muller, Gunther Netzer, Wolfgang Overath, Bernd Patzke, Karl-Heinz Schnellinger, Willi Schulz, Uwe Seeler, Berti Vogts, Wolfgang Weber, Horst Wolter und Reinhard Libuda. This version of the collector board had holes for a 4-2-4 formation plus spaces for substitutes. Complete set with grubby and stained collector card and coins. Bronze coloured typical coin designs. 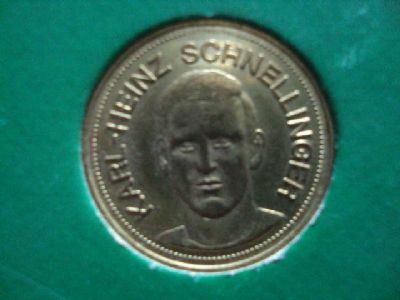 There's only one Karl-Heinz Schnellinger!